A month ago, my sister Sophie informed me that the next time I visited her she wanted to take me to a cute little New Orleans-style cafe to try a sandwich. This sandwich was not just any ordinary slap-two-pieces-of-meat-between-bread-and-call-it-good sandwich. Nope. This was a very special sandwich made with fresh roasted turkey, cranberry chutney, melted brie cheese, pressed together between two perfectly toasted pieces of house-made cranberry walnut bread. "I want you to try this sandwich and then recreate it for your blog!" were her exact words. Never one to turn down brie, or a sandwich for that matter, I dutifully accompanied her for dinner and we had a grand old time and I tasted what truly proved to be a magnificent sandwich. I assured her that I could and would most definitely recreate it. But, I'm going to do it in steps because like all works of art, this sandwich is going to take a bit of time. Thankfully, Sophie is patient with me. For those of you who don't know her, Sophie is my hilarious sister with a booming laugh, an obsession with cats, and talent for all things theatrical. 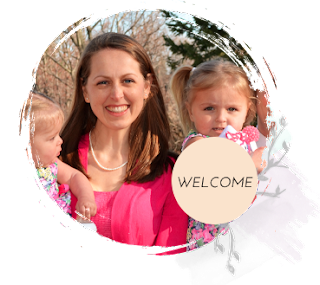 She was also my maid-of-honor eight years ago. And this was about the time she was ready to kill me for continually stalking her with my camera. The other lovely looking lady there is my sister Catherine. She's a hoot too. And so photogenic! Enough shenanigans, back to the food! The first step in building this sandwich masterpiece is, of course, the Cranberry-Walnut Bread. I knew exactly where to find the perfect recipe for this purpose: my beloved copy of Peter Reinhart's The Bread Baker's Apprentice. 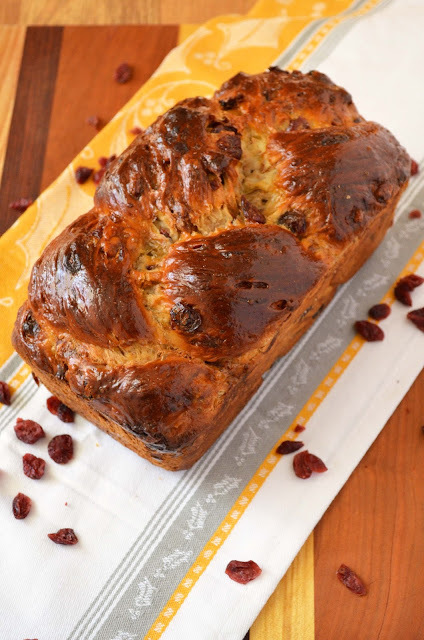 In this bread-baking treasury is a fabulous recipe for Cranberry-Walnut Bread that I have made at least once a year for the past seven years, usually around Thanksgiving or Christmas. In fact, I normally made it just to spread with a thick layer of brie and then top with a bit of caramel-pecan chutney. Paul and I used to enjoy this delicacy while watching a Christmas movie on December 23rd before we had three children and pass out from exhaustion after getting everyone to sleep by 8:00 pm. The tradition might need to be resurrected this year. However, memories of that bread still linger and to the kitchen I went this week to bake a loaf for Sophie's sandwich. This is probably the simplest of all Peter Reinhart's bread recipes. It just requires a little bit of patience because, like most sweeter yeast breads, it needs a longer proofing time. Reinhart dictates that the bread should be braided like challah in order to give it a decorative appearance worthy of the centerpiece for a holiday gathering. Since I am planning to make sandwiches, I did a simple three-strand braid and then tucked the ends under and stuffed the entire thing in a 9x5" loaf pan. An egg wash is added to give the finished loaf a dark, shiny appearance and after being allowed to bake for about 50 minutes the most gorgeous loaf emerged! Naturally, I helped myself to a slice as soon as it was done cooling and it did not disappoint! The rest of the sandwich shall be revealed later, but this loaf of bread is truly a crowd-pleaser on its own! 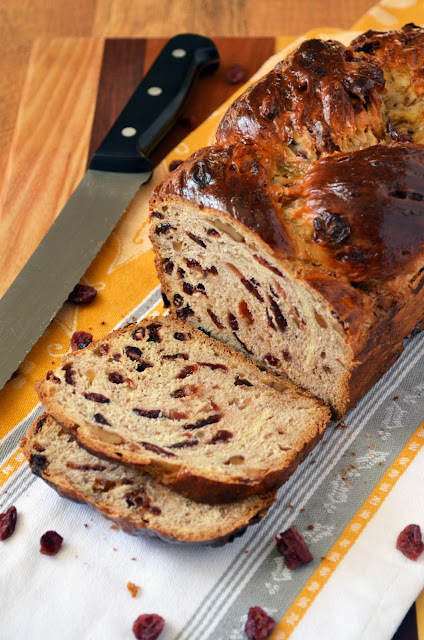 Slightly sweet from the generous amount of dried cranberries baked into the slightly sweet dough and studded with toasted walnuts, a loaf of this bread would make a wonderful gift for friends, relatives, teachers, and coworkers. Just send along a little wedge of buttery brie to go with it and you will be loved and praised forever! Stir together flour, sugar, salt, yeast and zest in a large mixing bowl. Add eggs, buttermilk and butter. Stir, slowly adding water to make a soft, pliable dough. Transfer dough to a floured counter and knead until smooth, soft, and slightly bouncy when poked. Alternatively, you can need using the dough hook of the stand mixer. Add water or flour as needed to adjust the consistency. Add cranberries and knead for another 2 minutes, then add walnuts and gently knead in until evenly distributed. Transfer to an oiled bowl and cover in plastic wrap. Let rise for about 2 hours, or until dough doubles in size. Transfer to a counter and deflate slightly. Braid as desired and then transfer to either a loaf pan or a baking sheet. Brush with half the egg wash and place the remaining egg wash in the fridge for later. Proof uncovered at room temperature for about 90 minutes, or until dough nearly doubles. Preheat the oven to 325 degrees while the bread proofs. Remove the cranberry walnut bread from the pan and transfer it to a cooling rack. Allow the loaf to cool for at least an hour before slicing and serving.